The little town was Serenity: in name and nature. Then the railroad and miners came, dragging violence and death behind them. Renamed Hell, the sleepy town changed under the rule of Ike Cordis. Known as The Devil, Cordis controlled The Three Horsemen, the fastest guns in town. Long forgotten was the fourth horseman – a man riding a blue roan. A man determined to make The Devil burn in Hell! 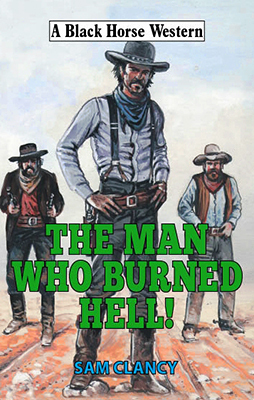 The third book from Sam Clancy once more features United States Deputy Marshal Josh Ford, son of Bass Reeves. You don’t need to have read either of the previous novels as this is pretty much a stand-alone story. Sam Clancy is a pseudonym used by Brent Towns and he starts this book with a prologue that lasts a couple of pages and ends with the line, ‘What the hell have you done?’ Combined with the fiery scene that Bass finds himself riding in to, which leads to him uttering those quoted words, how can any reader not want to find out too? The author knows how to pace a story well, has created a terrific cast of characters of both sexes and has come up with a hard-hitting plot that demands you keep reading. There is also a further complication for Ford as he finds his former lover in town. Action comes thick and fast, meaning there is never a dull moment in this excellent tale before it ends in a dramatic and superbly told final showdown. I never got around to reading the earlier Josh Ford books, Valley of Thunder and Even Marshals Hang! but on the strength of this entry into the series I must rectify that oversight as soon as possible. Issue one of Hot Lead, a new hardcopy western fanzine is now available via Amazon. 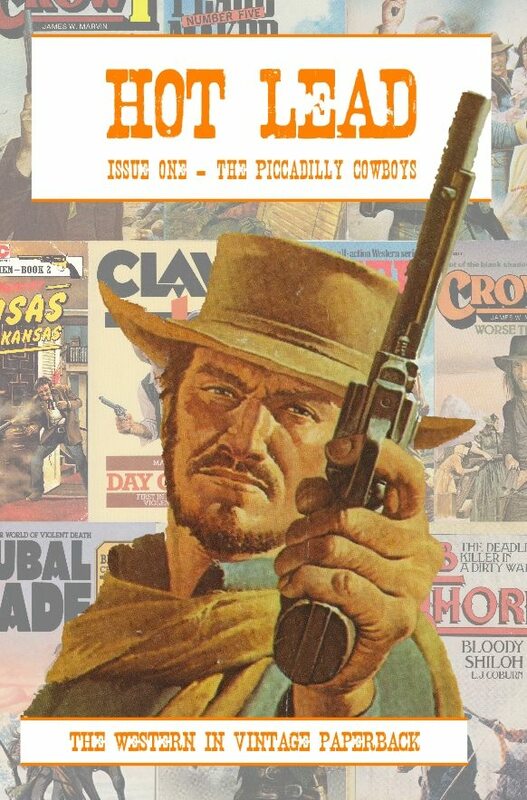 This first issue contains 60 pages and all about the books written by a group of writers known today as The Piccadilly Cowboys. Inside you will find an interview with Terry Harknett, who wrote mostly as George G. Gilman and under this pseudonym put out the following three series, Edge, Adam Steele and The Undertaker. You’ll also find detailed looks at both Herne the Hunter and Crow, along with a review of one book from every Piccadilly Cowboy series. Hot Lead has been put together by editor Justin Marriott, ghost editor Paul Bishop with contributions from myself, Steve Myall. Issue two is almost ready to go and will feature the Art of the Western and issue three will be about the American Adult Westerns. So, please grab a copy and help make this fanzine a success. Zach Fugate came home from the war to the mountains of Kentucky, only to be greeted with hostility, because he had fought for the North. So, to avoid drawing his family into a shooting feud, he loaded a canoe with trade-goods and his few belongings and headed west for the Black Hills of the Dakotas. 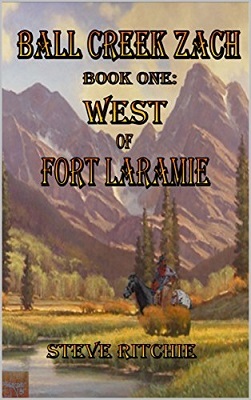 He left Ball Creek to avoid difficulties, but no matter where his travels take him or how hard he tries to avoid it, trouble seems to always be waiting for Ball Creek Zach. Nevertheless, romance blooms and new friendships are made as gunsmoke hangs in the air and blood covers the ground from St. Joseph to Fort Laramie and back. A book of adventure and discovery. A tale that tells of Ball Creek Zach finding a place to set up a new home that also contains riches of more than one kind. Steve Ritchie’s descriptions of this hidden valley paint vivid imagery that place the reader right there, experiencing the wonders and grandeur of nature as if you were standing right beside Fugate. Ritchie also has the ability to create believable characters and many of these will become new friends for Zach, one he hopes to settle down with. Along the way Zach comes across those who want what he has, those who just like to push others around, and these are dealt with expertly and swiftly. Ritchie’s action sequences being well told and filled with tension. I’ve purposely been a bit vague in revealing too much about the story as I don’t want to give anything away to those intending to read this book. The author also plants the seeds for storylines that could be developed in the sequel, plots of not just hope and happiness but also of confrontation that could threaten Zach’s new life in the worst way possible. Hopefully I will get around to finding out soon as the sequel to this story Return to the Sweetwater, was also published in 2017. Brought up with death, he learned to kill. Suddenly there were a lot of folks wanting to meet up with Barnaby Gold. The man on the Trans-Territorial Stage for a start. He got his meeting – a short one. One item only on the agenda and a final conclusion. Very final. The woman, too. She wanted a meeting, though of a rather different sort. She was luckier. Got what she seemed to be looking for. But the final meeting was the one that Gold himself wanted. One he’d been seeking for a very long time. No ordinary meeting. Not when the preparations included three new coffins and three freshly-dug graves. Gilman includes enough backstory to fill in those who haven’t read the previous books to explain why Gold has a ten-thousand-dollar bounty on his head, which in turn enlightens new readers as to what drives the man known as The Undertaker towards the final confrontation he engineers, and this is done in a macabre style that makes for a dramatic last showdown. 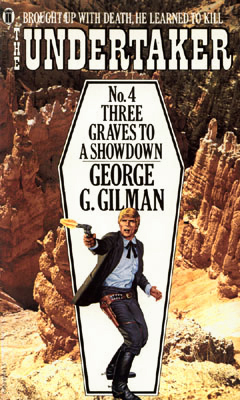 The Undertaker is, perhaps, Gilman’s least known western series, coming some years after Edge and Adam Steele. This, the fourth book was meant to be the last and the ending certainly reads like it could have been, and for me would have made for an excellent conclusion to the series, but the publisher persuaded the author to write two more. Like Edge with the razor he carries behind his neck and Steele with his stick-pin and thugee scarf, Barnaby Gold has an unusual weapon, a swivel Peacemaker, and he also has another gimmick; his screw together shovel that he uses to bury all those he kills, in fact insists on doing so. Filled with tough-talking and acting characters this story races along at great pace, offering a couple of surprising revelations along the way. For those who have read the other Gilman series’, you’ll find less of the groan inducing puns, and the graphic violence somewhat toned down, but that is not a criticism in any way for this book is highly entertaining and a must read for all Gilman fans.